Product categories of Lawn Mower, we are specialized manufacturers from China, Electric Lawn Mower, Cordless Electric Lawn Mower suppliers/factory, wholesale high-quality products of Small Electric Lawn Mower R & D and manufacturing, we have the perfect after-sales service and technical support. Look forward to your cooperation! ULITE electric Lawn Mower motor is magnetic, motor wire rounding is copper. The motor longevity is longer. And using longevity is longer. Power also is high. This machine could make your working more easily. 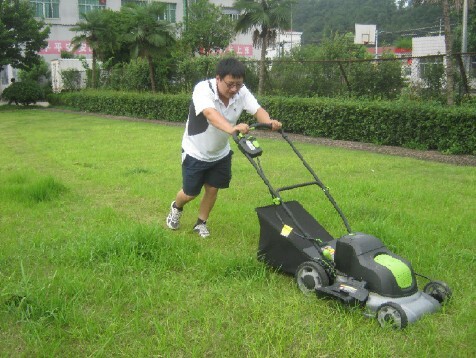 Our electric lawn mower is suitable for 100 square meter lawn mower cutting. Electric driver is more easier than gasoline to drive. We also have cordless lawn mower. 20inch size is more bigger then Electric Lawn Mower. Could cut more big square size grass mower. It is side and back displacement. 2400Ma battery could work long time. One charge working time is 3 hours. And could cut 1000 square meter grass mower. Charge time is 6 hours and have auto taking off power. 1. Use the plug correctly. Don`t change the plug and wire separately. And don`t access to power if the plug wire is broken. Take off the plug in time when the electric drill isn`t used. 2. Don`t extend the length of the power wire, and keep the power wire away from the heat source and oil. 3. After working, pls pack the machine. And stay it to clear. 4. After working, Please clear the grass in the blade and deck. Don`t let grass go to motor house. If there is too more much grass. The motor would be broken easily.